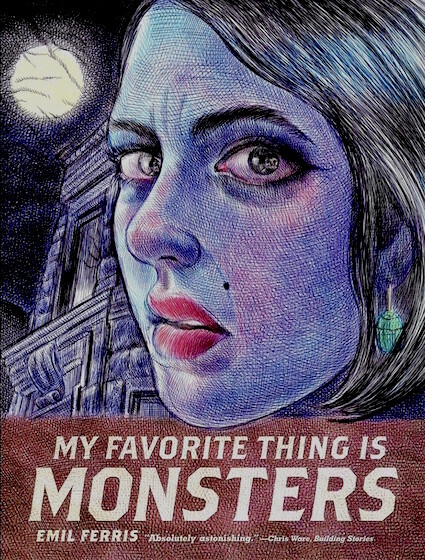 It's hard to describe Emil Ferris' My Favorite Thing is Monsters. It's partly a coming-of-age story set in Chicago's gritty Uptown neighborhood in the late 1960s; we read the sketchbook diary of the 10-year-old narrator, Karen Reyes, as she discovers some of the secrets of the adults around her and begins to harbor a few of her own. The book is printed to resemble a lined, spiral-bound notebook of the kind that Karen carries with her and draws in obsessively. Ostracized and bullied at school, Karen symbolizes her sense of difference from everyone around her by drawing herself as a young werewolf, with elongated lower canine teeth, protruding jaw and pointed ears. As that self-portrait suggests, My Favorite Thing is Monsters is partly an homage to the horror comics of the era, which make up the bulk of Karen's reading (the story is interspersed with mock covers of titles such as Terror Tales, Ghastly and Dread). It's also partly a cancer memoir, as Karen watches her mother slowly being ravaged by the disease. And it's also a mystery, as Karen sets out like a trench-coated, fedoraed Harriet the Spy to solve the murder of a sympathetic neighbor, Anka Silverberg, and learns of the hidden torments in her past. 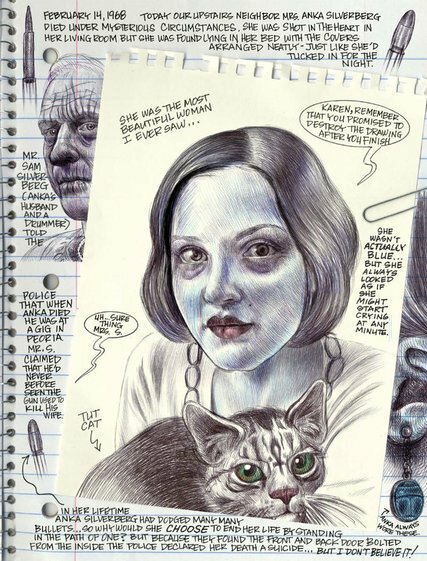 It's also an expression of a love of art nurtured not only by lurid comic-book illustrations but by afternoons spent at Chicago's Art Institute (or as one character has it, "the art castle"), where Karen is taken by her protective older brother Deez. To encompass such a wide range of narrative registers and tones Ferris deploys an equally wide range of drawing styles: highly detailed and finely cross-hatched realism, comic-book fantasy, corrosive Weimar-style expressionism, dashed-off sketches, and renderings of famous artworks. As Karen discovers, "there are a lot of things we don't see every day that are right under our noses. . .Just maybe — monsters are right under our noses, too. . ." My Favorite Thing is Monsters portrays many kinds of horror, and the saving (and disturbing) power of art. 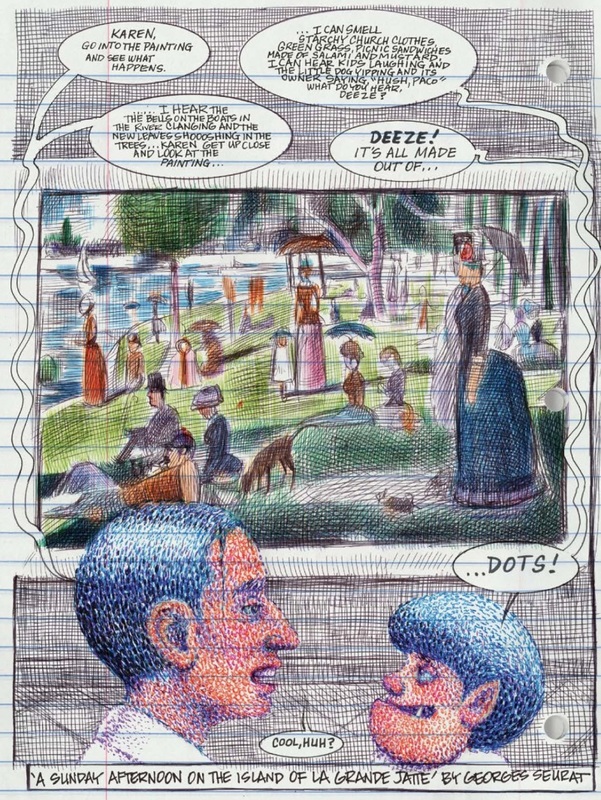 This is one of the most strikingly drawn and vividly imaginative graphic novels I've encountered. The only disappointing thing about it is that the story isn't yet complete. For that we'll have to wait for Book Two, which was initially announced for October 2017, but has had its publication date pushed back twice and is now scheduled for release in August 2018. For an interview with Ferris in which she discusses being paralyzed by West Nile virus (and which links to the story of the entire 10,000-copy first print run of her book being held hostage in the Panama Canal by the shipping company's creditors), see "Emil Ferris: 'I didn’t want to be a woman – being a monster was the best solution'" in The Guardian. Update 22 December 2018: My Favorite Thing is Monsters was selected for my Favorites of 2018: Books. Now you're in the realms of exotic and irrational entertainments I relish! I wish you had gone into greater detail, but I also appreciate that you assiduously avoid spoilers. Honoring that, still I would like to point out the brilliance of Ferris's choice to render Karen as a diminutive werewolf, playing into the way that kids both feel ugly and special at the same time. I also love Karen in a trenchcoat playing the private investigator in that "Harriet the Spy" way that kids sometimes approach the world through surreptitious fantasies, although these are dark and twisted ones. Yet still naive, in the way that kids by definition have to be, whatever traumas they are subjected to (not a spoiler: I think Anka's story should to be read that way, too). Another important dimension of the book for me, is Karen's relationships with the other kids in the comic, little girls Missy and Sandy and teenager Randy. She's not alone. Finally, on a formal level, using wide-lined notebook paper for the page background makes the diversity of cartooning techniques seem "natural." When "Doodling" in notebook, any kind of sketching is acceptable, from the most crudely rendered to the most technically sophisticated. Ferris exploits this to full advantage. Like you, I can hardly wait for Book Two. I think you're right that in my concern to allow readers to discover the brilliance of My Favorite Thing is Monsters for themselves I didn't go into sufficient detail on some of its key aspects. I didn't want to spoil, but also didn't want to belabor or over-explain, what emerges so organically in Ferris's book. So readers have been forewarned; proceed at your own risk! I could have said much more about Karen rendering herself as a monster, for example. I wrote that taking on a monster identity is a way for Karen to represent her sense of difference from everyone around her, but of course it signifies more than that. Monsters are scary, but also powerful; they are feared and reviled by "normal" people, but at the same time share a connection with one another as fellow outcasts. The opening sequence depicts a dream in which Karen, as a werewolf, has to flee from an angry mob; the nightmare gives her an excuse to seek comfort from her mother at a time when (we soon learn) her mother is increasingly reliant on Karen to take care of her. Werewolves are shape-changers, of course; by taking on that identity Karen can be both a fierce protector of herself and her loved ones, and at the same time a frightened young girl. The symbolism is wonderfully multifaceted. You also mention Karen's companions Missy, Sandy, and Franklin. It's interesting (and significant, I think) that of this group only Franklin is fully rendered as a (Frankenstein's) monster. Sandy does not have a monster identity, and Missy is only drawn with vampirish traits at those moments when Karen and she are emotionally closest. Missy is only part-monster because, under pressure from her mother and her peers, she is withdrawing from her intense and romantically-tinged friendship with Karen. Karen writes, "Sometimes I think if you were to put one of those x-ray machines up to me, you would see the old Missy, the Missy from when we loved monsters together and I have to take care of that part of her. . .because inside of Missy that part is in a coffin, in a crypt, staked, and hungry, and all alone. . ."
It's part of the brilliance of My Favorite Thing Is Monsters that it has so many layers of meaning. Thanks for giving me the opportunity to expand a bit on just a few of them.